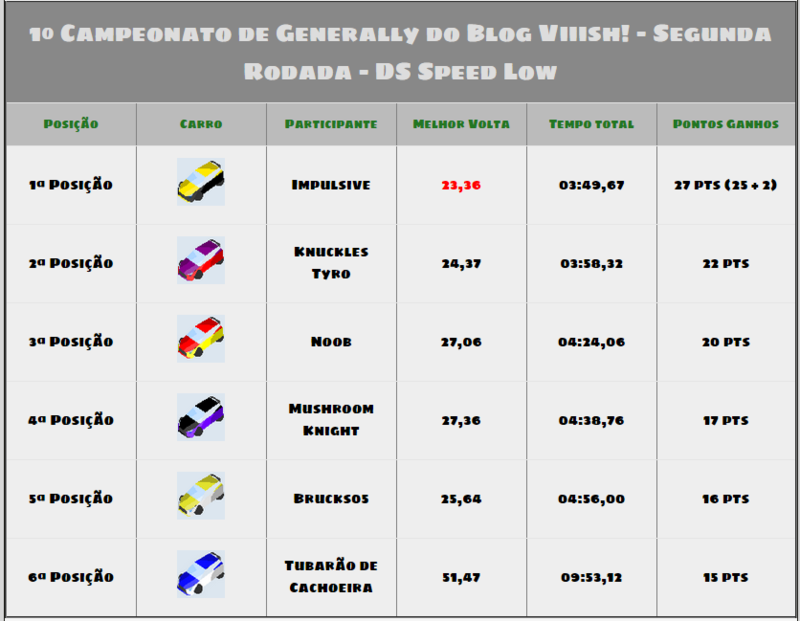 GeneRally International Forum - View topic - 1º Campeonato de Generally do Blog Viiish! Estamos criando um campeonato simples, amador, para diversão de Generally! As informações estão no site abaixo! If you want to race with us, just send here your nickname, the color of your car and an avatar. 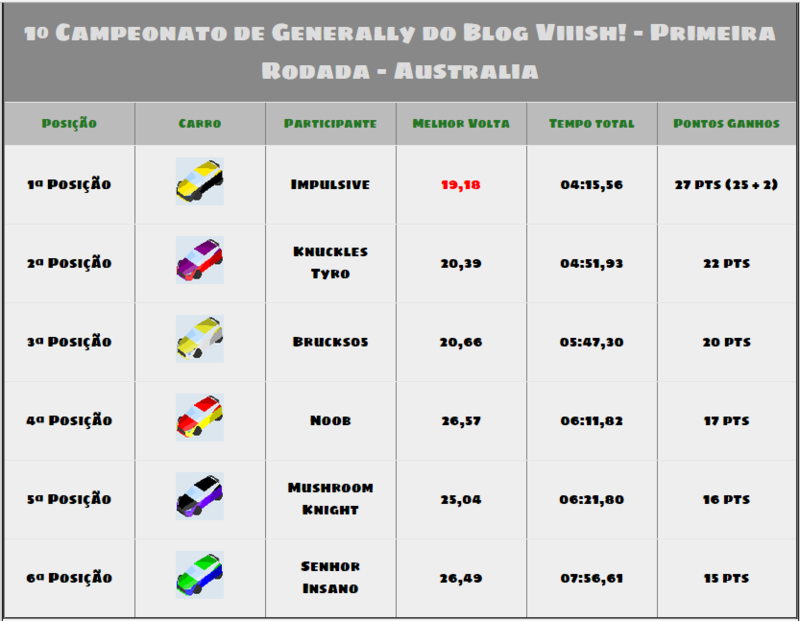 Here we will have the rules of the championship! So without rolling too much, let's get the definitions and all you have to do! Start Date: It is the date that begins to valid that step, that is, from this date you can send us the ZIP file with the necessary files to participate in the round (these files will be detailed further down). Delivery Date: It is the FINAL date accepted for sending the ZIP, remembering that you do not need to send on the day of delivery, any day between the start date and the delivery date is a valid date. Date of Publication: It is the date that the race leaves! I'll post the save file here so you can watch the race. And on the first day of posts after the round has post telling everything that rolled! Beauty, now that you already know how the rounds work, how do you sign up? - Avatar to put in the table (I think our form does not allow to send image, if it has the URL of the image, send it. And ready! You are participating! People who are having difficulty opening SAVEGAMEREADER, download the dlls.zip file that is in the link above, and I follow the tutorial that is ON THIS LINK HERE. Do the requested with the 2 files inside the ZIP (only change the name of the file in the command). Difficulties can look me in the comments or by email! Last edited by knucklestyro on Thu May 24, 2018 11:35 am, edited 2 times in total. 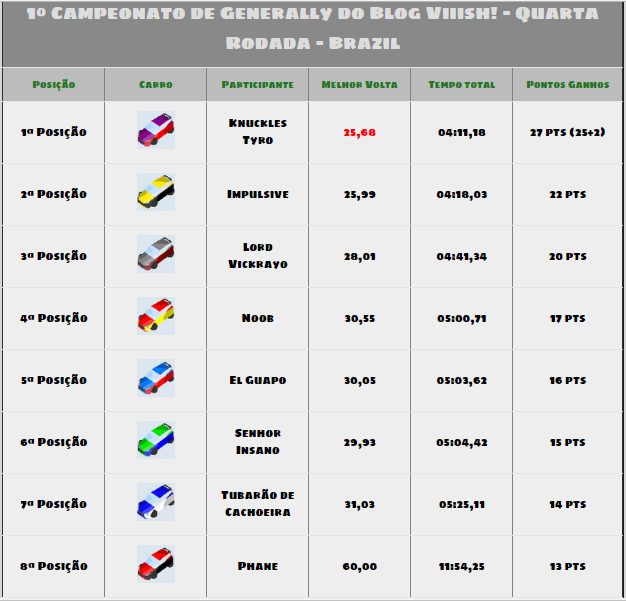 Re: 1º Campeonato de Generally do Blog Viiish! Last edited by knucklestyro on Sat May 19, 2018 10:14 am, edited 1 time in total. I really want to participate in this championship. The replays narrated on youtube are very cool. I also hope that other people will also participate. Hey fmonteiroa, done! You are in! You can register here sending the avatar, color of the car, email and nickname! I'll post the other results above. See you! 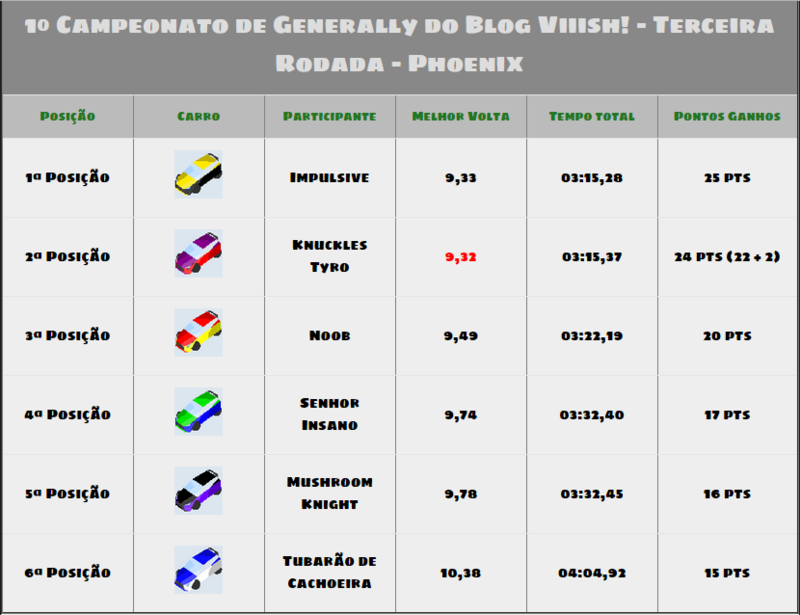 Results of the Third round: Phoenix! We are accepting new challengers! cmon guys! The grimeloid, got it! You are in! I guess knucklestyro forgot to update this thread, because the championship is still going on, BTW. What I mean is that you can still join it. 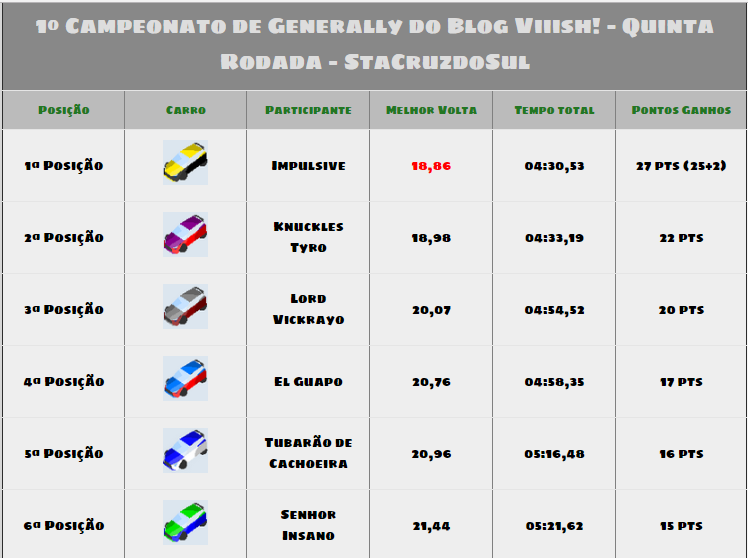 The championship is almost finished, the 23° race results will be sent in 16/12 and the last race's deadline is 31/12. If you want to participate, just send your time to blogviiish@gmail.com. You can read All instructions on the posts above.